Recently I installed a humidifier, which came with a new humidistat unit. I removed the old humidistat at that time, but never installed the new one because I wanted to install at the same time a new, digital, programmable thermostat. Having recently bought such a thermostat, today I installed both units. This is the easiest one of an upcoming wave of home improvements focused on improving the energy efficiency of the house. The humidistat is a Honeywell H8908B model. It is the simplest kind, featuring a single rotating potentiometer for setting the humidity level. The installation required only connecting a pair of wires on the unit to a pair of wires coming out of the wall. 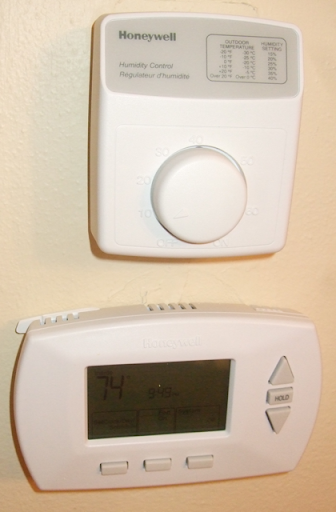 The thermostat is a Honeywell RTH6350D model. The hardware store had a dozen or so different thermostats, but they were all Honeywell. This at once made the decision easier and harder, but I chose the one programmable for "5-1-1" which means separate heat timings for Monday through Friday, and Saturday, and Sunday. Although the thermostat comes with two thick booklets, one for installation and another for operation, I found the thermostat totally straightforward. I installed it easily, connecting the four colored wires coming out of my wall to four screw-shut connectors on the thermostat unit. Setting the times for the heat to turn on and off was easy enough and obvious enough that I could do it without consulting the booklet, which is exactly how easy and obvious it should be. This thermostat comes with a handy little laminated cheat sheet which folds up and slips behind the thermostat, for future reference. Before installation I turned off the power to the furnace; when I turned the power back on, the furnace came on according to the program I had set, and all was well.